The Nerja Cultural Centre is a theatre and exhibition centre and offers an ever increasing number of events for all ages and tastes. Although modest on the outside the centre boasts a 355 seat auditorium with a nine metre wide stage and provision for wheelchairs and disabled visitors. The centre has excellent facilities with every care taken in order that audiences enjoy the best experience possible from their visit. As well as the auditorium the cultural centre provides for conferences and seminars with facilities for workshops and educational courses. The Cultural Centre offers shows of all types from productions by local groups, film viewings, art and photography exhibitions as well as musicals performances from both national and international artists. 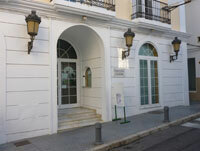 The Cultural Centre is located in Calle Granada not far from the Balcon de Europa and the Church of El Salvador. It is in an excellent position with ample parking in the vicinity provided by the municipal car park underneath Plaza de España and the free car park visible from the N340. These vary according to the events that are on offer at the moment of your visit however the majority of evening shows start at 9pm. Vary according to the event.